Your parenting knowledge should grow as your child does. Tips from our experts can help. Kids, Energy Drinks and Heart Health: What’s the Hype? The sheer quantity of energy drinks on grocery store shelves is overwhelming. There are currently over 100 different brands, in every size and flavor, all of which promise to improve both mental and athletic performance. It is all too inviting, particularly for adolescents in search of that extra performance boost. However, the truth is that most of these drinks contain chemicals and additives which can have serious adverse effects on teenagers’ hearts. Almost all energy drinks contain excessive amounts of caffeine. While there are strict regulations on the maximum amount of caffeine allowed in over-the-counter products, there are no limits for the amount allowed in energy drinks. Furthermore, it can be hard to determine exactly how much caffeine is in a particular energy drink. Some brands currently on the market have about 500 milligrams in one can –the equivalent of 14 cans of soda! Caffeine has clearly been shown to disrupt sleep patterns and worsen symptoms of anxiety. Most energy drinks also contain other additives such as taurine, ginseng, I-carnitine, and yohimbine, some of which have been associated with palpitations, arrhythmias, seizures, and gastrointestinal upset. Energy drink consumption appears to increase production of a natural chemical in the body called norepinephrine, which in turn increases heart rate and blood pressure. This is potentially hazardous in children with underlying congenital heart disease. Additionally, several studies have looked at caffeine’s impact on an electrical measurement of the heart known as the QT interval. These studies have shown a significant increase in the corrected QT in otherwise healthy subjects one to two hours after consuming these drinks. 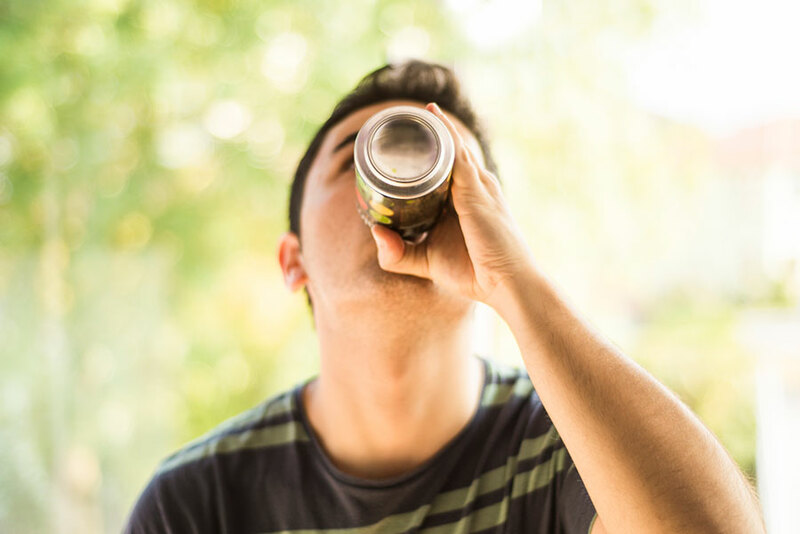 It can be especially dangerous to gulp energy drinks quickly, to drink multiple cans over a short period of time, or to combine the drinks with alcohol or stimulant medications (such as Adderall). Some heart conditions have been reported in patients who had multiple energy drinks, including atrial fibrillation and lethal ventricular arrhythmias. There is currently no clear data that these drinks boost performance, either on the athletic field or in the classroom, and much of the available literature is industry-sponsored. Not surprisingly, however, these drinks are heavily marketed and advertised on television channels, websites, and social media sites that are attractive to children and teenagers. If you are drinking these beverages, please talk with your health care provider about the risks, as well as the possible complications with any medications you are taking or conditions you may have. For more information on children’s heart health, please visit the Pediatric Heart Center website or talk with your child's pediatrician. Dr. Kristin Lombardi is a pediatric cardiologist with the Pediatric Heart Center at Hasbro Children’s Hospital. She is board certified in both general pediatrics and pediatric cardiology, with a special emphasis on congenital heart disease and fetal echocardiography. In almost any article about healthy living, it will mention that managing your weight is critical for your overall health. Heart disease is the leading cause of death in the United States. If you follow health news, you know there are plenty of articles and tips about how to be heart-healthy. Can't sleep? What's your remedy? Childhood asthma cannot be cured, but it can be controlled.